I was browsing through my files in Google Drive, looking for something else, when I ran across a presentation that was a few years old. One slide confidently asserted that teachers should trust that students would progress through the “phases of reading workshop”: the BabyMouse Phase (reading primarily graphic novels or books well below their ability), the Transition Phase (beginning to moving away from easy and familiar books), the Self-Challenge Phase (actively seeking a favorite author or genre or an appropriate series), and the Good Choices Phase (solidly confident as a reader). I shook my head and laughed ruefully at my former self. Yes, you can trust those phases . . . until you have the class that reminds you that nothing in teaching is guaranteed. I had That Class last year. It was nearly time for winter break, and no matter how many enticing books I book-talked, no matter how many book trailers we watched, no matter how many conferences were spent looking over my observation notes about what books had been read thus far in the year, the majority of my class was still reading and rereading (and re-rereading) graphic novels. In hindsight, “majority” may be an exaggeration of the actual numbers, but even if it was one-fourth of the class still stuck at “the BabyMouse Phase,” my beliefs about the natural progression of the phases in reading workshop were being sorely tested. Something needed to change. So I packed all the graphic novels from our classroom library into my big wheeled crate and took them home. It didn’t take long for the graphic novel addicts to realize that their reading workshop escape mechanism was gone. I discussed my decision with the class, explaining that the need for all of them to self-regulate their reading choices and challenge themselves by reading books in text-based formats was what had caused me to remove all the graphic novels from our classroom library, and that furthermore, although I would not stop them from checking graphic novels out of the school library, they would need to take them home to read. There would be no reading of graphic novels in Room 226 for the rest of the year. It was a rash decision. Reactionary. Authoritarian. Quite unlike me. 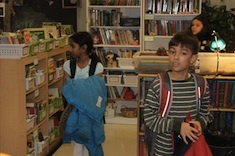 But I’m given only nine months to grow the readers who are in my class, and nearly half our time together was gone. Desperate times require desperate measures. Luckily, every instructional move has both intended and unintended outcomes. The first consequence was intentional. I expected for the readers who were stuck in graphic novels to learn the stamina and strategies necessary for text-based reading. And that happened. But there were surprises along the way. The first surprise consequence was that the readers of diverse texts came to the rescue of their floundering classmates, recommending books that would wean them away from graphic novels, wisely guiding them to books with some picture support, or short novels of 100 pages or so. Because the recommendation of these books came from classmates, they weren’t scorned as “easy” books or “baby” books. 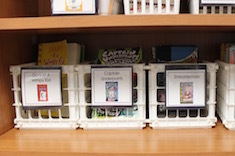 Our classroom community of readers was strengthened by my rash decision. The second surprise came when verse novels were discovered. Gone Fishing and Gone Camping (by Tamera WIll Wissinger) went from reader’s hand to reader’s hand nonstop for about two months. Many readers then went on to explore other books in this format I never would have guessed they would try. Finally, the end-of-year growth-model assessments showed a spurt of growth for almost every reader in my class. I know better than to claim cause and effect, but it was a nice coincidence, nonetheless. Jump-starting the transition phase was a reaction. Possibly even a kneejerk reaction. But looking back, I’m wondering if I can replicate these successes with intention. 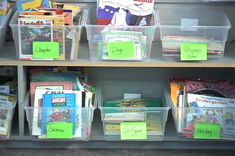 The authors of Every Child a Super Reader (Pam Allyn and Ernest Morrell) recommend shifting and adjusting classroom libraries three times a year. 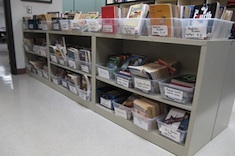 Maybe next year’s class won’t need the same drastic “support” to move away from the “BabyMouse” phase and toward “Self-Challenging” and “Good Choices.” But by cycling different books through our classroom library, I will be able to give my students a library that grows with them as readers. Putting the graphic novels back onto the shelves of my classroom library next fall will necessitate the removal of some books to make space. If I’m strategic about which books stay in my basement until January, perhaps I can begin to truly support readers rather than forcing them to make the transition from graphic novel series into books that will help them to grow as readers toward self-challenges and good choices in all formats. 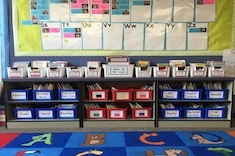 Bitsy Parks explains how she designs her first-grade classroom library for “gradual release” throughout the school year in a way that allows students to build book-browsing skills. What’s a Great Workshop Day? 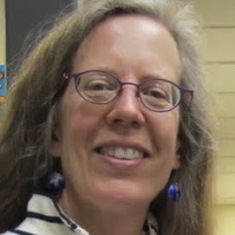 Mary Lee Hahn considers how the success of any day has to integrate observations from conferring, lessons, and share sessions.